Readers who have been following DC's Batman Inc. have seen Bruce Wayne's roster of international crime-fighters grow with the addition of new characters like Nightrunner and Batman Japan (formerly known as Mr. Unknown), but the newest member has a pretty interesting history. After a glimpse last month, Batman Inc. #6, which hit stores yesterday, gave fans a proper introduction to David Zavimbi, the new, jetpack-powered Batman based in Northern Africa. 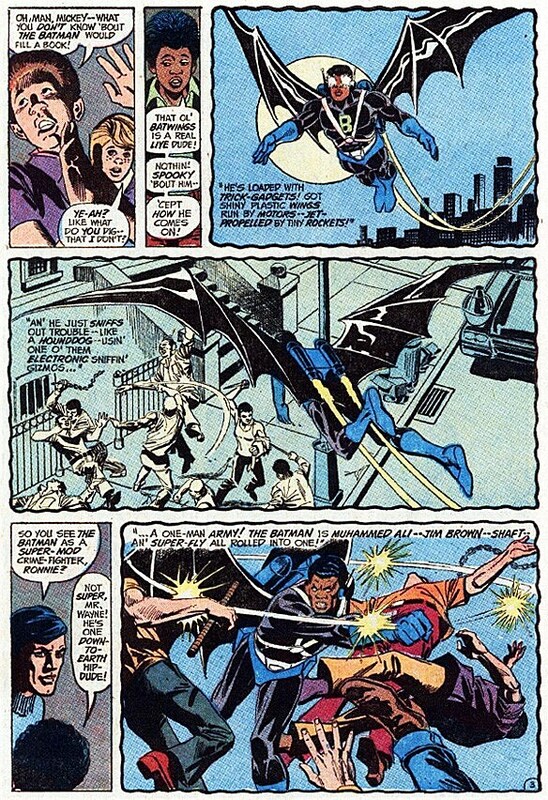 What wasn't in the issue, however, was the codename that we at ComicsAlliance are proud to exclusively reveal: Batwing. 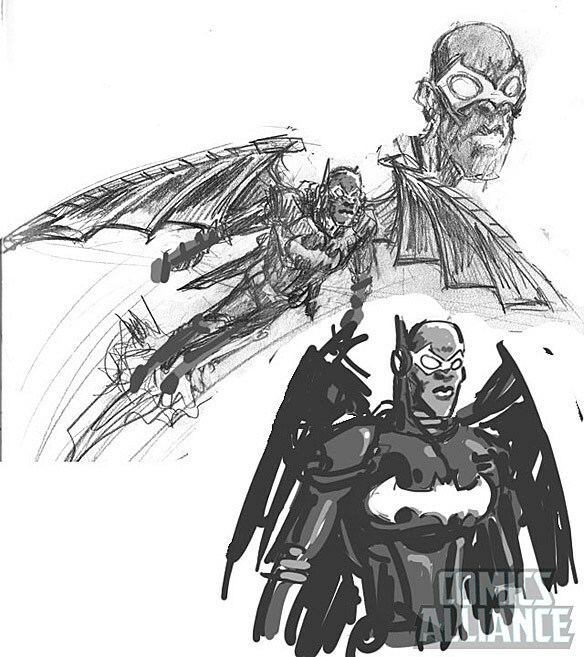 Check out a few exclusive character design sketches from Batman Inc. artist Chris Burnham, as well as a look at this brand new character's surprising history below! Batman Inc. #6 finds the original Caped Crusader, Bruce Wayne, enacting a plan to overwhelm a secret criminal army by unleashing his own team all over the world, striking so fast that the only thing the crooks know is that the Batman is everywhere -- and that he could be anywhere. It's a grand bit of misdirection and deception on the part of a character that's always relied on scare tactics and letting his larger-than-life reputation do half the work for him against the superstitious, cowardly lot of the world's criminals that's taken to the next level as he battles the evil organization known as Leviathan. The issue also includes a surprising -- and very welcome -- appearance from Cassandra Cain, the former Batgirl who hasn't been seen very often since exiting stage right to make room for Stephanie Brown in the pages of Batgirl #1. Now, she's back with a slightly modified costume, appearing to operate under the codename of "Blackbat," along with a "Stealth Team" made up of the Dark Knight's original attempt at franchising, The Outsiders. This isn't Morrison's first attempt at creating an African super-hero. Twenty years ago in the pages of Animal Man, he recast B'wana Beast as the new hero of South Africa, Freedom Beast. Now, at the other end of the continent, he and Burnham have created a character that, like Freedom Beast, draws on an interesting and pretty obscure legacy. There's a change between the costume in that issue and the one Batwing's wearing now, though, in that it removes the full-face helmet. Whether or not this is just a held-over element of the other major influence on the character, it has the very nice side effect of making him an African hero whose race is very visible. That sets him apart from characters like Firestorm, who is meant to be drawn with a darker skintone to reflect that he's a combination of a black guy and a white guy, as well as Cassandra Cain and even Nightrunner, who have mostly been seen in full-face masks. 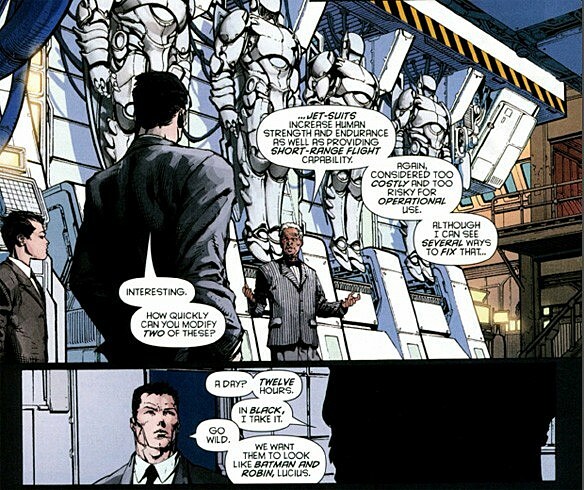 The second influence on Batwing, however, pointed out by ComicsAlliance's own David Uzumeri, is the one that provides him with both his basic look and his name: a short story in Batman #250 called "The Batman Nobody Knows." 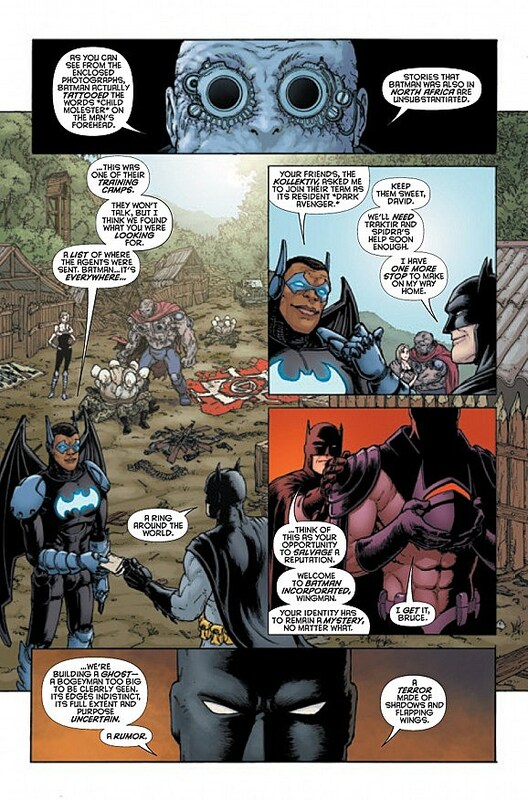 "Ol' Batwings," complete with jetpack, who's "Muhammad Ali, Jim Brown, Shaft and Super-Fly all rolled into one!" Now that is a character I want to read about. And thanks to Morrison and Burnham, now we can.